Today, to start off the month of December, Awfully Big Reviews Guest Post comes from author Yvonne Coppard, She offers an interesting review of Susan Maushart's book, particualrly suitable for a time when Christmas Lists everywhere are filling up with all kinds of gadgets, devices and electronic toys. My thoughts are that only a brave person would follow this example but it sounds as if it is an interesting expereince to read about. Thank you for your choice, Yvonne. Could you live without Internet access, television, mobi, mp3 player or any other kind of electronic media in your home for 6 months? Think you’re hard enough? OK – what if you had 3 teenage children, and decided take away all their stuff, too? 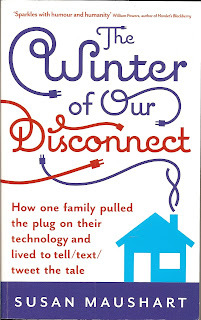 Susan Maushart, an American journalist settled in Australia, imposed a 6 month ‘digital detox’ on her family because in recognising an addiction to social networking in her own life, she took a long hard look at her kids and felt it was all getting out of hand for them, too. The book, a gift from my daughter, was well chosen. As a borderline technophobe and virtual hermit who is neither on Facebook (gasp! ), nor Twitter (horror!) and who never, ever, talks on the phone while walking down the street (sad Norma No-mates! ), my daughter could see this was the book for me. But even I would find it hard to function without my desk top, lap top, i pod shuffle and blackberry. My children have grown up and left home – so would my husband, if I announced that he could no longer watch football on TV, or check cricket scores online. Maushart is a braver woman than I. And she really saw it through, with almost no compromises. What comes out of Maushart’s account of these six months in the digital wilderness is fascinating. Her writing is succinct, painfully observant of her own life as well as what’s happening in society. 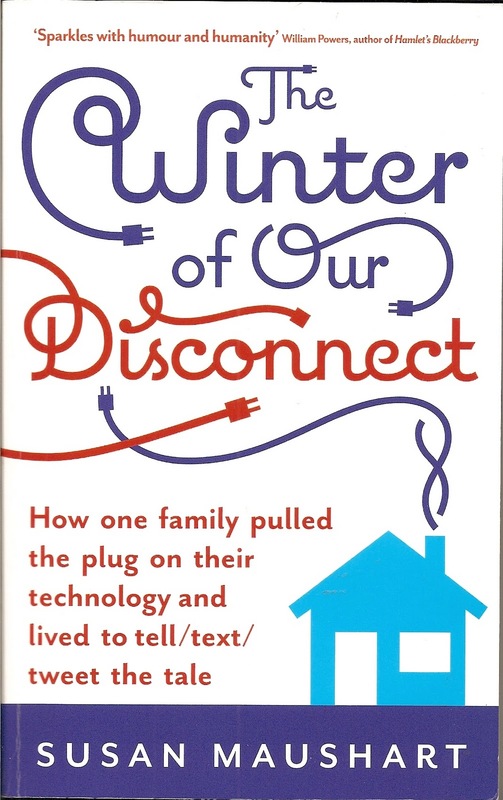 Along with the funny stories of the family’s adaptation to an electronic version of cold turkey, Maushart has thoroughly researched the good and bad effects of the huge technological advances this century has seen. She distinguishes between the ‘Digital Natives’, born with technology at the crib-side and imbibing it from the start, and the Digital Immigrants – like me – who have to overcome not only ignorance, but a sneaking fear that technology is a wolf in sheep’s clothing, ready to bare its teeth and consume us as soon as it gets the chance. Many of the outcomes of the technological miracles of our age are amazing, in a positive way, and some are disturbing. Children have never had so many opportunities to explore and learn about the world – nor so many distractions and pressures. We all know that the arrival of the digital age has been a mixed blessing; we talk about the ‘bite-sized’ generation whose concentration spans are dismal but whose knowledge of the world outstrips that of their parents (and often of their teachers, too). Maushart evidences this not only from her own family (the son who re-discovered his saxophone to alleviate the boredom, and is now a professional musician; the daughter who finally learned how to sleep at night) but from good quality research around the world. The way she weaves family memoir, common sense knowledge, literary references and humour make an entertaining as well as challenging read. It was a life-changing experience for her family, and it was fascinating to see how the mother and each of the three children adapted to survive. The book has weighty points to make, but there’s plenty of wry humour, too. Maushart recounts telling her youngest daughter, Sussy, about a man who completely lost it when his 3 sons didn’t hear him yelling at them that dinner was ready; they were all plugged into their earphones while simultaneously gawping at a huge plasma TV. The father threw the TV out of the window, where it smashed into smithereens. There was a long period in my family’s life when, as parents and foster parents to a mixed bunch of teenagers, we had to resort to subterfuge, blackmail and manipulation to get everyone around the dinner table together. We believed this was an essential opportunity to share news, keep a quiet eye on a child who was struggling, build the confidence our mob needed to face the world – all that good, life-affirming stuff. But it was very hard work – and we only had the single telly, with four channels (WYBI!) and one clunky telephone in the hall (LOL) to contend with. I bet these days, family meals would involve every single one of us sitting at the table shovelling food with one hand while texting or playing on Nintendo with the other. So hats off to Susan Maushart – firstly for the courage and staying power to undertake the task, and secondly for an entertaining, informed book that really makes you think about how you relate to the people around you, whether they are at home, or work, or out there in cyber-space. And about how far we’ve come, we human beings, and how much we have yet to learn.